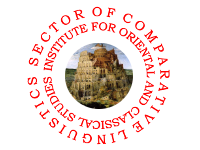 The Sector of Comparative Linguistics of the IOCS is a research and teaching division whose faculty members are engaged in research on historical linguistics. The faculty of the Sector of Comparative Linguistics of the IOCS belong to the so-called Moscow School of Comparative Linguistics. This trend combines the traditional methods with research of both near and distant language relationship. It is aimed at the reconstruction of maximally ancient language stages.